After 5 months I'm facing charging issues in my nokia 6.1 plus. Charger gets automatically connected / disconnected whenever i put my phone on charge . Actually I am also facing same issue.i have discussed with service centre they told me it will not cover in warranty and it cost 1750. Try to clean it with tooth pricker. I have read this it is the most common problem of type c usb.I think I made a big mistake buying this Nokia crap. If I too faced this problem than I will compell people to never buy your device. Please provide the solution for charging issue under warranty. Several websites have reported that Nokia 6.1 plus has a widespread issue with USB-C port in terms of manufacturer fault. Visit any Authorised Nokia Service center they should change the sub-board without any cost if your phone is still under warranty. i m having the same trouble with my Nokia 6.1 plus... It's not charging because the faulty port... Pls do something..
my nokia 6.1 plus is also not charging properly and service centre are not repairing it in warranty, what should i do? Even my charging port damaged, will it replace in warranty or not? I have the same issue and my phone is not covered under warranty since I purchased a device model that was not offered in the US. How much did any of you have to pay to replace the charging port? Other than that issue, the phone works flawlessly and I love it. Even I have the same issue, my phone cannot be charged when it is ON but can be when it is switched OFF... Is there any solution for this?? Nokia 6.1 plus, charging issue, its charging port not working after 5 months, please recall all your nokia 6.1 plus phones. I have sold my nokia 6.1 plus as i have also faced this issue. @Nokia: Is this hardware problem or Software problem? Quick fix for all: Try adjusting your charger pin on phone side until you see text 'Charging' on your phone's lock screen. Same issue for me , do we have to submit phone for 10 days to get port replaced ? 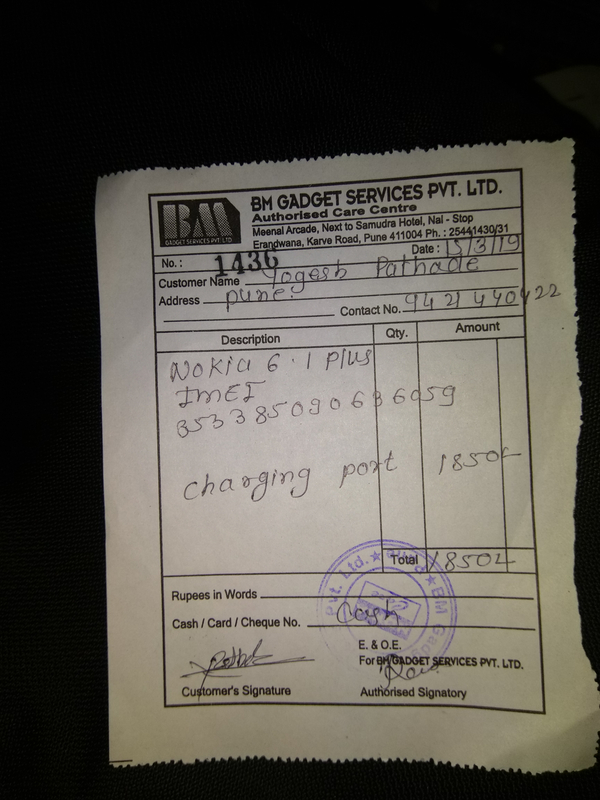 I had also paid 1850 rs for only these problem.And my device is In warranty also.What r u doing Nokia with costomer, how can i trust on you??? Would really appreciate if you can verify whether the USB C port in Nokia 6.1 Plus is of the same OEM as the one purchased of AliExpress. Some identifier that's there on the flex PCB might help in verifying the same.